Mr. Vernon Blanchard, 92, departed this life to be with his Lord on April 15, 2018. Funeral services will be held at 12 noon, Tuesday, April 17, 2018 at Damascus Baptist Church in Leah with Dr. David Stockton officiating. Interment will follow in the church cemetery. The family will receive friends one hour prior to the service at the church. Pallbearers will be grandsons and honorary pallbearers will be members of the Men’s Bible Class of Damascus Baptist Church. Vernon was born on June 6, 1925 in his parents home next door to his uncle Dr. Gordon Blanchard in Leah, GA. He was the youngest of 11 children and the son of the late Talmadge Blanchard and the late Claudia Morris Blanchard. He graduated high school in Leah and was drafted into the U. S. Army where he operated a tank in France during World War II. In 2009 he received a medal in Paris for his military service on Utah Beach in 1944. 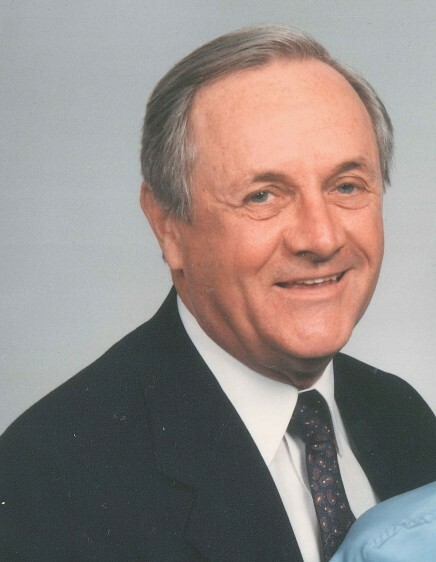 Mr. Blanchard owned and operated Vernon Blanchard Insurance Agency from 1964 to 1999 and retired as a Nationwide representative. Mr. Blanchard was a loving husband, father, grandfather and great grandfather and was preceded in death by his wife of 58 years, Catherine Lenoir Blanchard. In addition to his wife he was preceded in death by son-in-law, Jerry Stokes. Of utmost importance was passing his legacy of faith in Jesus Christ to all. He loved sharing his faith with others and did so by teaching sunday school at Damascus Baptist Church to the Senior Men. His life was a testimony of his faith in Jesus Christ. He is survived by his wife, Patron Lynette Blanchard of North Augusta, SC; son, Whit Blanchard and wife, Lisa of Augusta, GA; daughter, Lenoir Blanchard Stokes of Appling, GA; sister, Doris Blanchard O’Hearn of Evans, GA; grandchildren, Jimmy Blanchard, Scott Blanchard (Jenny), Zack Blanchard, Whitney Blanchard, Katie Fegert (Geordie), John Stokes (Mandi), Andrew Stokes (Jenna) and Michael Stokes (Lisa) and 9 great grandchildren. If so desired, please make memorial contributions to Damascus Baptist Church.